I recently took a fine arts course in bookmaking and had to go through the entire process of making a book, from start to finish: writing, layout, printing, and binding. I was able to produce a slightly larger book because I had access to the correct printing tools, but you can easily create a small book of your own on letter size paper. I won’t go into the technical aspects of bookmaking (i.e., InDesign, how to print booklets, etc. 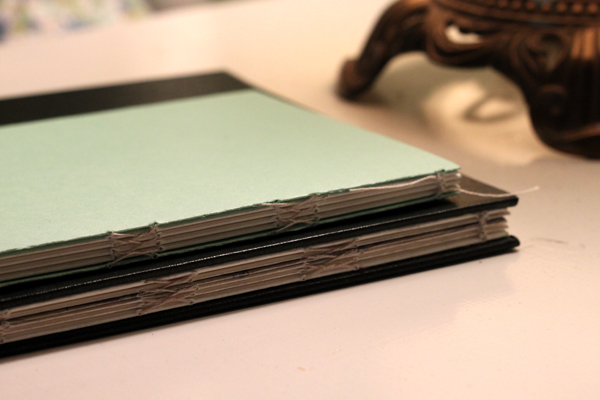 ), but I will go over the basic steps needed to bind your own books! 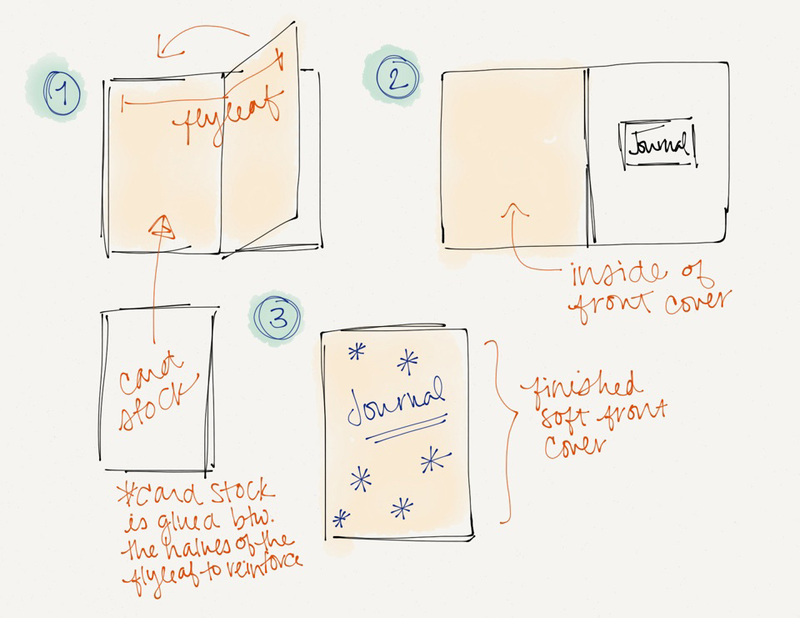 You can use this technique to make homemade notebooks and journals as well — they look beautiful and are so much more fun to write in when you’ve produced them yourself. And you can go crazy with selecting the perfect papers and creating your own covers. Supplies for your cover: either a thick card stock if you want a softcover book, or book board and book cloth if you want to make a hardcover book. *I know some of the above items can seem daunting to find, and some of the terms confusing. They are really not! Binding a book is a very exact process, but you’ll get the hang of it quickly. You just need to pay attention to the details before you begin if you want the best results. To make this a little less confusing, let’s discuss some basic terms for bookmaking. Signature: A signature is a booklet of “text” pages (which can be blank if you’re making a notebook) in your book. Each signature is folded, hole-punched with an awl, and sewn as one set — so you don’t need to sew each individual page, just each signature. If you look at spines of some books, you can see these page groupings (although not all books have them). Text block: All the signatures that make up the “text” pages of your book. Only two signatures are excluded from the text block: the flyleaves. Flyleaf: Fancy word for the first and last signatures of a book. The flyleaf doesn’t have writing on it, and its main function is to allow you to attach the cover (if a softcover, you the flyleaf is reinforced and becomes the cover; if a hardcover, the flyleaf is glued to the back of the cover). Generally, the flyleaf is a thicker paper, like a card stock. Open any hardcover book and you’ll see the flyleaves at the front at the back. Grain: All paper has a “grain direction” — one direction (long or short) will be weaker and easier to fold along than the other. I cannot stress how important grain direction is. If you want your book to lie flat and not pop open, you need to have proper grain direction. Most art papers will tell you the grain direction, otherwise you can test it for yourself: gently push against the long edge, and then short edge, of the paper as if you were going to fold it. Whichever edge gives you the least resistance is the way the grain runs — so make sure you cut your pages and structure your book so that you are folding along the grain at the center. The grain in your cover and flyleaves should also parallel the grain of the paper for the text block. 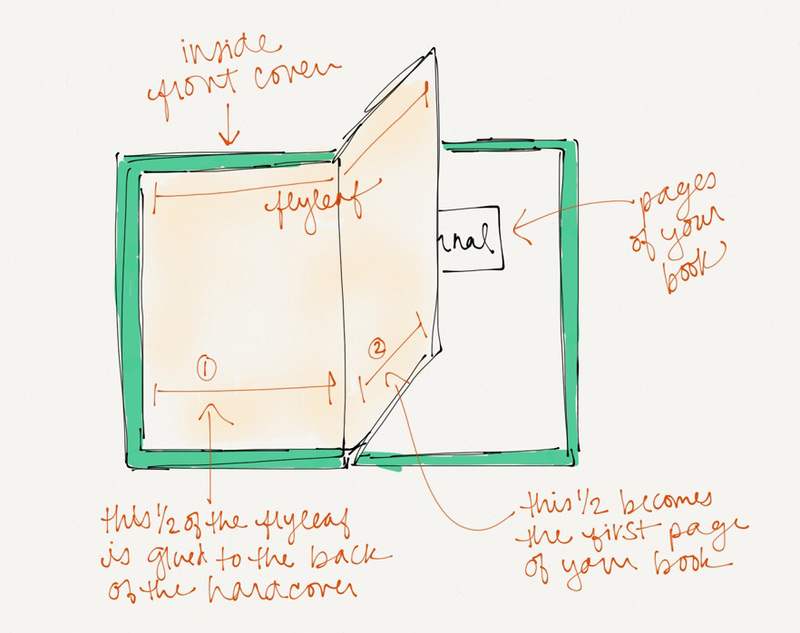 Bookboard: A hardcover board used to make hard covers. You can find it in the bookmaking section of any art supply store. It looks tough, but you can hand cut it with an X-Acto knife by making lots of shallow cuts along the edge of a ruler. Bookcloth: Special cloth used to cover bookboard. Can be fabric or leather, and you can find many varieties online and in art supply stores. Also has a grain. Here are some diagrams to explain all that (click to enlarge). Above: I used a decorative flyleaf for my book. 1. Cut your paper, and assemble your signatures. Decide what size you want your book to be and make sure you account for the fold. For example, if you want each page to be 8×9″, each sheet of paper will be 16×9″. I would recommend no more than four large sheets per signature (so 16 pages in a finished book). If you are using thicker paper, you can do two or three sheets to make sewing easier. You should aim to have at least three signatures in your text block, in addition to your flyleaves — otherwise the book will look weird. Make sure your grain direction runs along the fold (as pictured in the first diagram for an 8×9″ book). Also cut your flyleaves at this point (the equivalent of two 16×9″ sheets if your book is 8×9″), and make sure the grain for those matches. 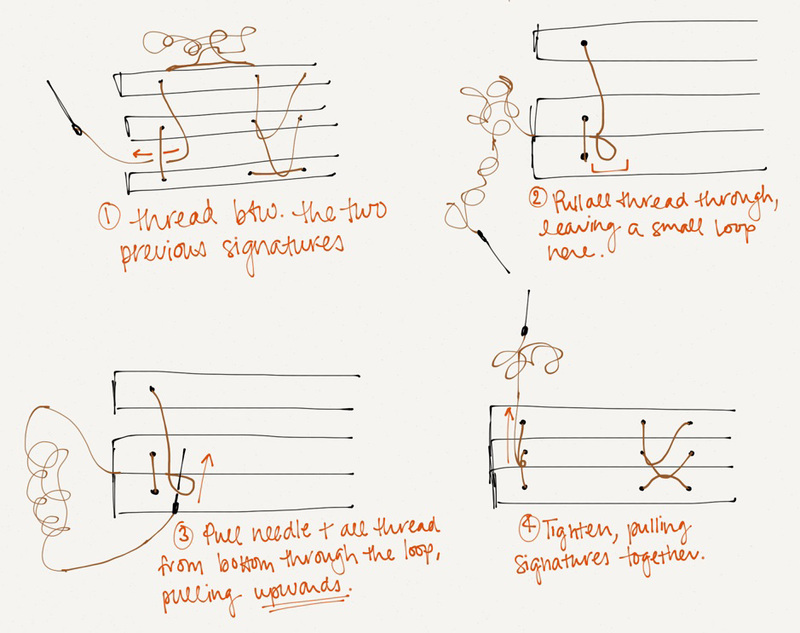 Fold each group of signatures (and your flyleaves, separately) and cement the crease using your bone folder (or the edge of a pencil, but a bone folder is better). 3. Punch holes in your signatures. Use your transfer paper to do this: align the transfer paper inside each signature, making sure either the top or bottom is always aligned. Use your awl to punch through the transfer paper and all the pages of your signature at a 45 degree angle. Make sure you punch all the pages per signature at one time. Repeat for each signature and the flyleaves. 4. Measure your thread. Measure the amount of thread you need using this count: the height of your book (generous), times the number of signatures (including flyleaves), plus two. You can thread your needle by flattening some of the thread near one end with your bone folder, threading the needle, pushing the needle through the flattened area, and tightening. 5. You are reading to begin sewing! This is where it gets a little tricky, but the stitches are easy and completely manageable. First, you’ll be sewing on your cutting surface. 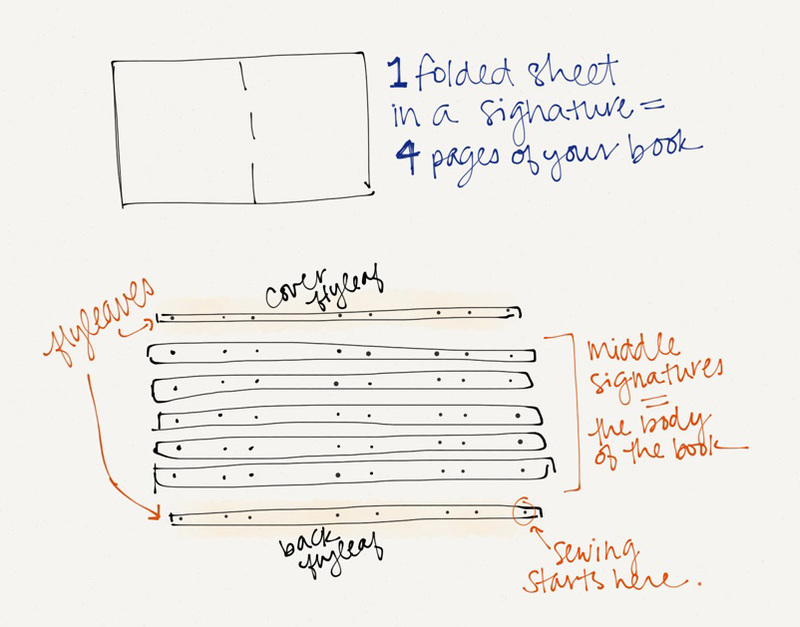 Assemble your signatures in the correct order (the way you want your book/notebook to read), and then place your book, front cover side down, with the page edges facing towards you. Flip the top signature towards you, so that you are looking at the spine (note: this should be the last signature in the completed book — the back cover flyleaf). Always start with the back of the book and work your way to the front. 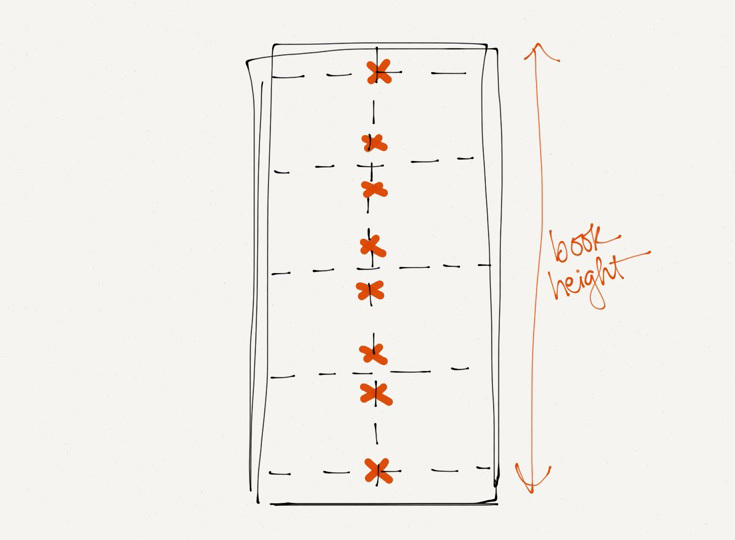 In all of the following diagrams, you are looking directly at the spine of the book — which is what you should see while you are sewing. 6. 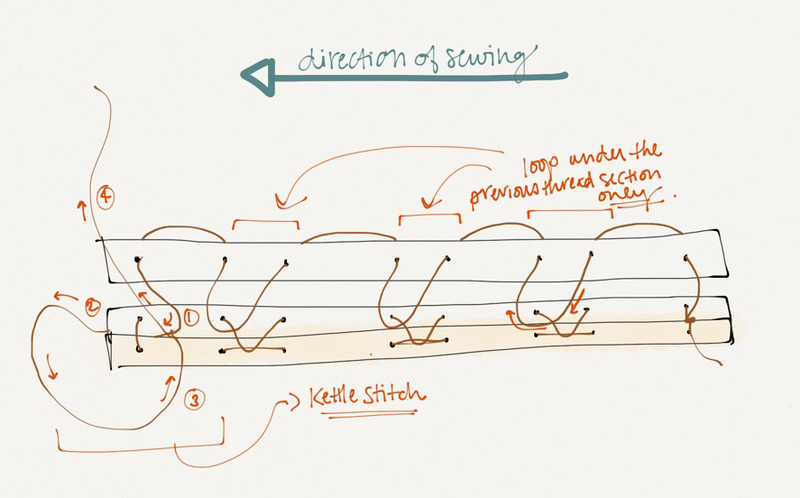 Start from outside the signature on the right side and always pull the thread in the direction you are sewing. Push the needle through the first hole, then out through the second, and so on, until you reach the end. Pull the entire thread through, leaving a loose tail (about 3-4 inches) at the right side of the book. Flatten the signature with your bone folder. 7. Place the next signature on top of the first. This will be the second-to-last signature in your completed book, or the last signature of your text block. Now you will be sewing in the the opposite direction, back towards the beginning. Go through the first hole on the left, and out the second. Then, loop the needle under the section of thread that remains on the outside of the first signature you threaded. Go through the third hole, out the fourth, and repeat this process until you reach the right end of the second signature. 8. Tie a square knot to secure the first two signatures. This is pretty straightforward: right over left, then left over right. (So you’re basically just tying two regular knots.) Be sure to tighten the thread as much as possible and flattening the book with your bone folder before securing with the knot. Always work on on a flat surface while sewing, and try and keep the book as flat as possible, with the spine aligned (preferably at the edge of a table). 10. Finish the last signature with two kettle stitches. Essentially, the last signature (which will be your front cover flyleaf) is added the same way as all the other text block signatures, except you will secure it twice with the kettle stitch. Trim the excess thread to about 1 inch, but no further (if having it stick out bothers you, carefully secure each bit of excess thread to the spine with a dab of PVA glue). 11. 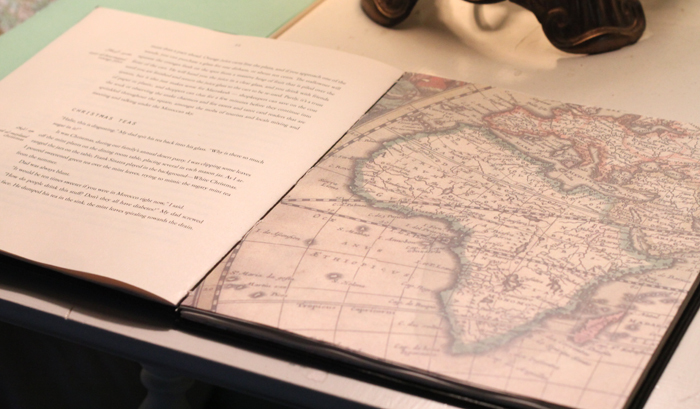 Once the text block and flyleaves have been bound with thread, add the covers to your book. There are many ways to do the covers, and you can get creative with them. Here, I’ll go over two very basic ways to do covers: softcover and hardcover, both with exposed spines (although it is fairly easy to modify so that the spines are covered). The initial diagrams I used to explain the role of the flyleaf can also be helpful in visualizing these two alternatives. Notice that each flyleaf creates four pages within your book, and that the interior two pages of each flyleaf can be glued together to create a thicker cover. While you can elect to glue them directly together, it is more prudent to glue a piece of card stock between them as reinforcement, so measure out a piece the size of your book (slightly smaller so that the edges don’t stick out), keeping proper grain direction in mind. Slip a sheet of waste paper between your flyleaf and text block to catch runoff glue, and keep it from ruining your book. Then, apply glue directly to the entire card stock insert (not the flyleaf paper) on one side, and attach to the interior flyleaf page on the right (the left if you are doing the back cover). 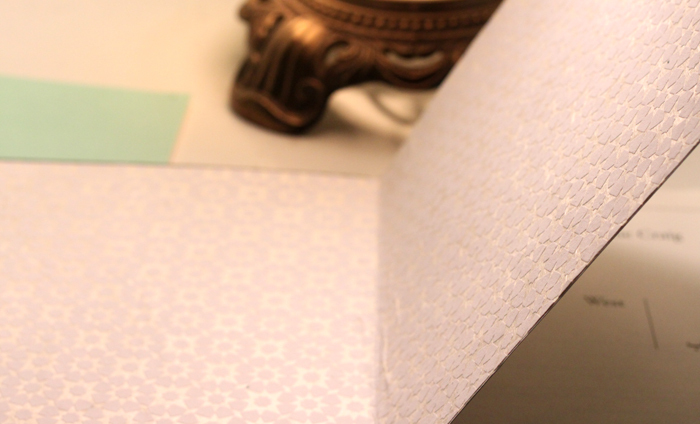 Smooth with your bone folder to avoid bubbles, and repeat with the other side of the card stock to create a softcover. Then, you’re free to decorate the cover however you like — applying a label usually looks nice. Essentially, you need to measure the size cover you would like out of the book board (again, be conscious of the grain). Remember to add a little extra length and height so that the cover hangs over the edge of the text block a bit — I recommend 1/8 of an inch per side. Don’t forget that you don’t want overhang on the edge with the spine — so you’ll add 1/8″ to the width, and 1/4″ total to the height of the book. Next, spread glue directly on the bookboard, and place on the cloth cover you would like for the book, keeping the grain lined up. Be sure to smooth out immediately with your bone folder. Cut about a 3/4″ around the edge of the bookboard, and then cut off the corners as marked in the diagram. Before measure the 45 degree angle, leave a bit of edge the thickness of the bookboard (you can use a piece of scrap bookboard to do this). Glue each edge of excess cloth onto the back of the bookboard — place glue directly onto the back of the cloth and stand the bookboard up to press the edge in before folding the cloth over. Secure with a bone folder. Do two opposite edges first, then the next set, being carefully to glue the corners in. Repeat to create the back cover. Secure the hard cover to the flyleaf by applying glue directly to the first page of the flyleaf (remember to use waste paper) and pressing the cover onto it. Smooth out imperfections with your bone folder, and repeat for the back cover. Add a label to your front cover (or not), and you’re good to go! Congratulations, you’ve just made a book! Be precise. Try not to skip the little steps — these are what truly make your book look well done. Specifically: pay attention to cutting precisely, grain direction, tightening your thread constantly, pulling in the direction you are sewing, and ALWAYS using your bone folder to flatten paper. Be creative! Above is the basic formula for bookbinding, but experimentation makes it great. Use an art paper for your flyleaf (or, if you’re doing a hardcover, cut art paper to the size of your flyleaf, place it inside the flyleaf, sew it into the book, and glue to the interior pages of the flyleaf). Experiment with different ways to design your cover — labels, collage, etc. Learn how to cut properly. When you’re hand cutting anything, always, always cut towards yourself. Stand up to give yourself leverage, and hold your ruler firmly in place as you cut against it. Take your time. 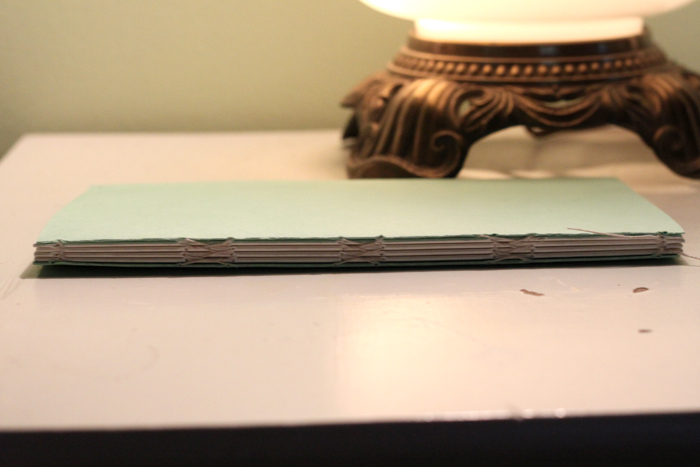 Sure, bookbinding can take a while. But its kind of like knitting (or, at least I assume so) — its relaxing as a result. This goes hand-in-hand with being precise. When it comes to glue, thinly and quickly cover the entire surface you are applying glue to. Start at the center of the surface and work your way out with a brush to get an even coating. Quality of materials will make a big difference in the final product — especially the paper you use. Don’t hesitate to reach out to me in the comments if you have any specific questions! Just a sampling of lovely gifts for the travel bug on your list. If you’re out of time and looking to purchase something in-store, be sure to check any special/global gift shops in your area (try Ten Thousand Villages if you have one nearby) for one of a kind items. These eleven gifts are practical pieces for any frequent flyer, and are reminiscent of cultures from around the world for those who don’t jet-set as often but still suffer from chronic wanderlust (aka me). World Market: Menhdi Chest | This beautiful Indian chest is perfect for storing jewelry and adds a touch of color to any room. $40. Ten Thousand Villages: Deco Leaf Bangle | Gorgeous fair trade bangles straight from India are an easy but thoughtful gift. $10. Ten Thousand Villages: Mosaic Mandala Bracelet | Fair trade from India. $16. Ten Thousand Villages: Frond Batik Bangle | A beautifully dyed wooden bangle, fair trade from Indonesia. $7.50. Anthropologie: Dip-Dye iPad Case | This case is economical space-wise and perfect for stowing an iPad in style during long plane rides. Plus, it’s a fair trade product, handmade by women in Guatemala. $58. Anthropologie: Driftwood iDock | One of the most unique ways to charge your iPod (seriously, no two pieces are alike) that I’ve seen. $98. J. Crew: Tartine Tote | A roomy and beautiful bag that will carry absolutely everything and last for years. $298. World Market: Star Leather Wrap Watch | I love watches. This one is perfect for any girl that needs to keep track of time while traveling, and has an adorable wrap design. $20. J. Crew: Leather Passport Case | A chic way to keep track of your passport. $45. Ten Thousand Villages: Blue Capiz Earrings | Dyed fair trade shell earrings from the Philippines. $16. Brookstone: Wheeled Storage Trunk | This trunk is perfect for traveling or makes for a statement storage piece. $166. For me, orange has always been a love-or-hate color. I know people who are absolutely obsessed with it, and others (like myself) who can’t get anywhere near it. I do not own a single piece of orange clothing; I do not have a single orange accessory; I have never decorated with anything orange. Despite my love of pinks and reds, I have never shared the same affection for oranges or yellows (and perhaps justifiably so — they both look terrible with my skin tone). 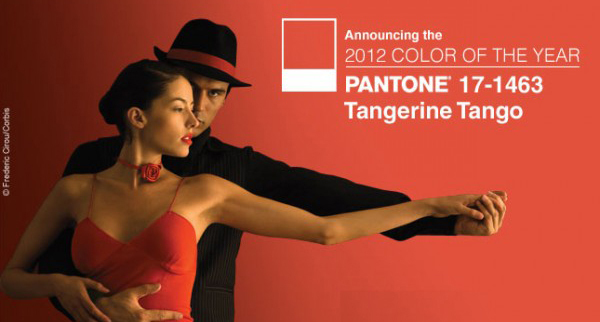 That being said, I do believe that Tangerine Tango will be an excellent color to represent 2012 as Pantone’s Color of the Year. Honeysuckle pink was chosen for 2011 — a bold, energizing hue — and tangerine takes this concept even further. It is revitalizing and vibrant, perfect for a bright and sunny new outlook. Despite my personal distaste for wearing orange, the pops of tangerine color that have been appearing on the runways as of late have been oddly appealing. 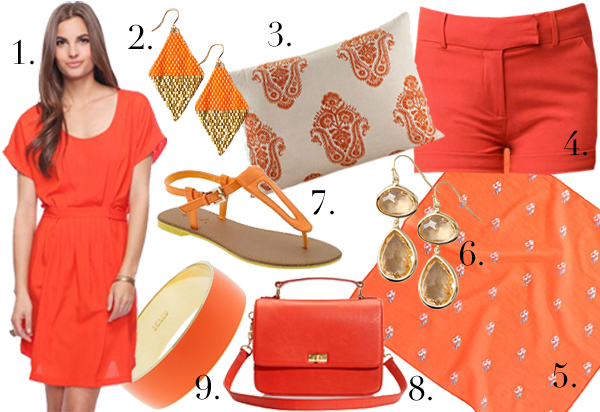 Sometimes I think orange is incredibly ugly, but when used right, it can also be incredibly chic and refreshing. It looks amazing with some good color-blocking, and is a great burst of color in chunky necklaces or skinny belts, cinched at the waist. Fashion aside, it is also a great accent color for decorating (just don’t paint an entire room in Tangerine Tango — try a few squares of accent color instead). Pleated Bib Dress, $25, forever21.com. Nantes Pennon Earrings, $98, anthropologie.com. Block Print Pillow, $20, worldmarket.com. Sparkle & Fade Suit Short, $49, urbanoutfitters.com. Fire Ring Drops Earrings, $32, anthropologie.com. Qupid Athena Sandals, $29, piperlime.com. Classic Wide Bangle, $28, jcrew.com. And with that, I shall return to the comfort of my all-black wardrobe. This has been quite enough orange for one day. Missoni for Target Launches in 10 Days! …And I, for obvious reasons, could not be more thrilled. Missoni has made its mark in the fashion world and become known for its very distinct signature zig-zag pattern. I have never been a print kind of gal (I honestly have no idea why because I like prints, I just never buy them), but Missoni managed to win over my heart a long time ago. Of course, the prices made many a zig-zag print bikini or cozy knit sweater not much more than a dream for me. But no longer! 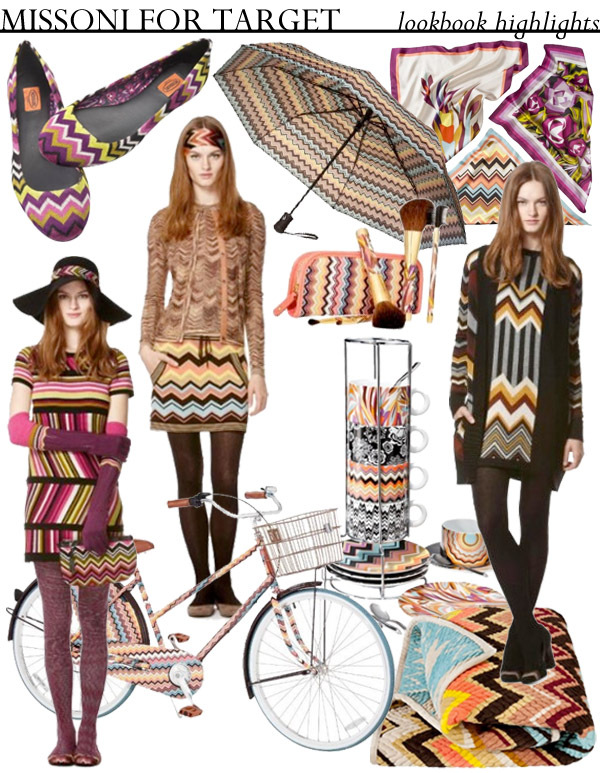 Because Target’s latest high-fashion designer collaboration is the one and only Missoni. The 400+ piece collection (!!!) will feature signature Missoni knitwear, swimwear, shoes, clothing and accessories, as well as home goods, stationary, luggage, and even a Missoni bicycle. (Okay, so I really like/want/need the bike, just because it’s cool.) Although not everything in the collection is my cup of tea (I mean, you can’t expect each item to avoid tacky territory), there are tons of fabulous pieces available for all fall fashion palettes, including lots of comfy knitwear. Some of the knits are cute, and I’ll probably be looking for some zig-zag patterned sweaters, like this one. A lot of the Missoni for Target accessories and home goods are super cute, I especially love those mismatched mugs! I think I’ll be spending more in the accessories department for this collection. What are your thoughts on the Missoni for Target collab? Love it or hate it?